I have called this a 2 Pie in a 4 Pie for a reason that will become clear in a moment. We will also consider some additional points that you should find useful too. I have to say at this stage that some people absolutely loathe pie charts. However, other people don’t! What is a Pie in a Pie Chart? 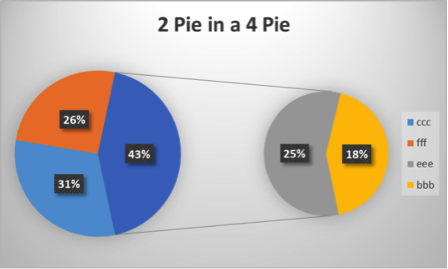 In the pip chart in the introduction we see what I called a 2 Pie in a 4 Pie chart: in this case there are four data points in the series and Excel has chosen the final two data points in the series to combine into one slice in the pie on the left. Those two points are then shown on the right of the diagram. 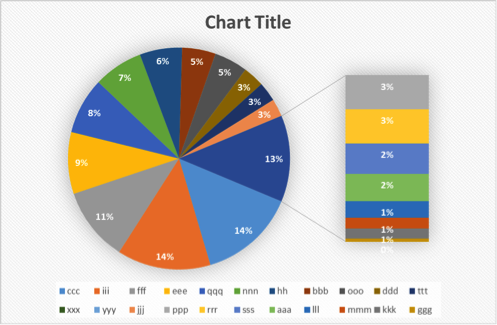 The pip element of the pip chart, the right hand part of the diagram shows the combined values in proportion to each other: the Pie % in the table below. That means, in the case of the example above, that the two combined data points of 24.78% and 18.58% respectively are shown in the pip element as 57.14% and 42.86% respectively: the Comb % in the table below. That is, choose the middle of the three pies shown under the heading 2-D Pie. That’s it! That’s all you do. 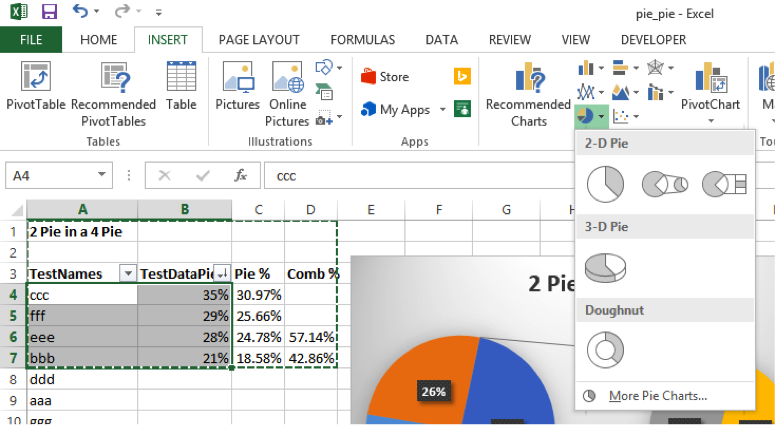 Excel will tell you how many of the slices are to be combined together, which are then shown as the right hand element of your pip chart set up. How Many Slices will be Combined in the Final Slice? 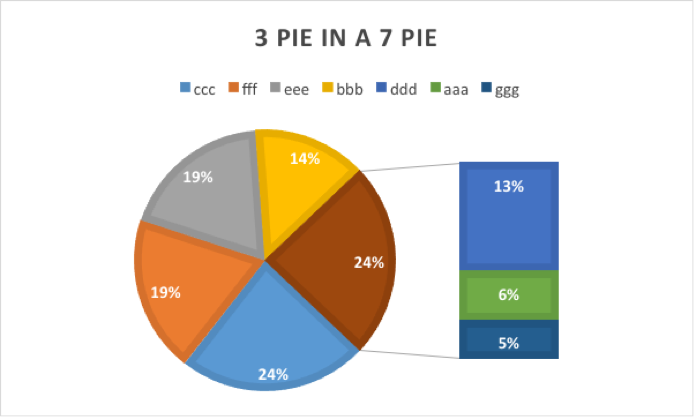 At first you might be mystified at how Excel decides how many data points it should combine in the final slice of the initial pie: the pie on the left of our pip diagram. There is a pattern to it, though. These are the starting points of our slices: for one and two data points, there will be a combined slice; for 3, 4 and 5 data points there will be 2 combined slices; for 6, 7 and 8 data points, there will be 3 combined slices. And so on. Please note: I used the trendline for this and it MIGHT be inaccurate here and there but I don’t think so! When you just enter some data into your worksheet and then create your pip chart, Excel just gives you your pip chart. It doesn’t take the largest numbers of the smallest, it just takes the last one or two or three data points and combines them. Fine! At least we know what it is doing! How can that help us though? It can help in this way. By sorting the data, your combined slice will automatically contain the 1, 2, 3 … smallest values. Good. Suppose you don’t want the smallest values but you do want, for example, data points bbb, ddd, ggg in a 3 Pie in a 7 Pie example? Well, just put them in the final three places in your data range. I know, not so smart; but it works! 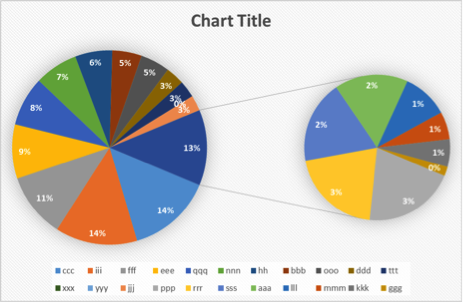 Consider the next section, how to use your pip chart to communicate data now to take things a little bit further. In this case, it’s still effectively a pip chart but they have turned the smaller pie chart into a set of bars of columns instead. Just as good or bad, don’t you think? Imagine you want to show the detail of eight data points in the smaller chart but you don’t have the 22 data points you need for Excel to provide them for you. There is a way! Create dummy, empty, data points to make sure there is a total of 22 data points in the range for your pip chart. Then drag the eight data points you want to explore into the final eight rows of your data range and Bob’s you Uncle. 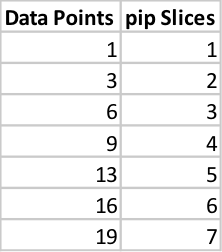 This would work for any number of data points where you don’t have enough data for Excel to create the number of pip elements you want.